I've been going to yoga on Mondays and Wednesdays with my running friends which has been good for me since I'm awaiting my second (roll eyes) knee surgery on now my left knee. That's schedu led for March 11. Well, I like my yoga mat, but the holder for it is awful. The strap itself is ok for what it is, but it's attached to two elastic circles that hold the mat in a cylindar. Seems the elastic is stretched out on both my mat and Dave's and it's not really functioning the way it should. At first I was going to knit a yoga mat, but then decided that since the yarn would really stick to the mat I would be better off with a sewn yoga mat. Then began the research. 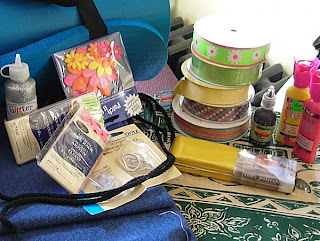 Yes, I'm a little ODC in that way, but after searching the net high and low and gathering information, doing a little shopping and digging through the ever growing stash of stuff to make stuff that doesn't really get made I've come up with a plan for my sewn yoga mat. This of course is a blend of all the information I've gathered. First off.... Here's most of the stuff I've collected to start the project. Although I did dig through my fabric stash, my ribbon stash, found some unused bag straps in the process and have searched the net high and low for knitted yoga poses (which I didn't find) for a special finishing touch... I think. I still have to dig and ponder through my yarn stash for that concept idea though. First off wash, dry and iron the fabric.